The key take-away from this session is that you need to plan your FUNNEL before you plan your product. I have been victim to a similar mindset where we plan out our product and work hard on building an amazing product, but put no thought into the actual funnel and pricing. While we spend all these hours building the product and tuning it to perfection, when the launch day comes – it flops and then all the motivation disappears. This is why it is equally – if not MORE IMPORTANT to focus on the funnel. If your funnel is set right and you’re getting a steady stream of leads and customers profitably – it allows you to dedicate more resources on improving the product in the future. In today’s “15-Minute Sprint“, I laid down the entire Membership Funnel Map and then discussed potential numbers and pricing strategies. After that, I created a couple of new lists inside Sendlane and then went inside our membership site and created blank pages, a logo, and imported the FSO theme settings. 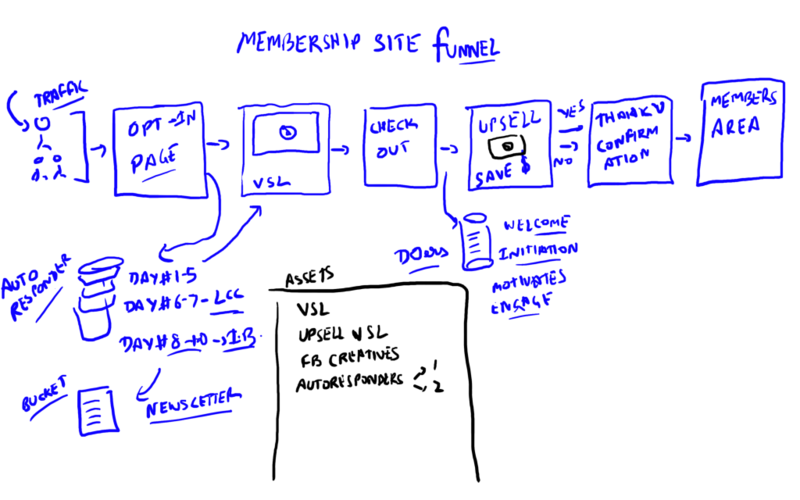 There are several approaches to take while building a membership site funnel and there are pros and cons to each. You could have an organic traffic blog where you pitch your membership site in a banner and the link takes them to a VSL/Sales page to subscribe for premium content. You could have a low ticket product (one-time) in the frontend, with a subscription trial as an upsell. You could have a straight up trial page in the frontend. 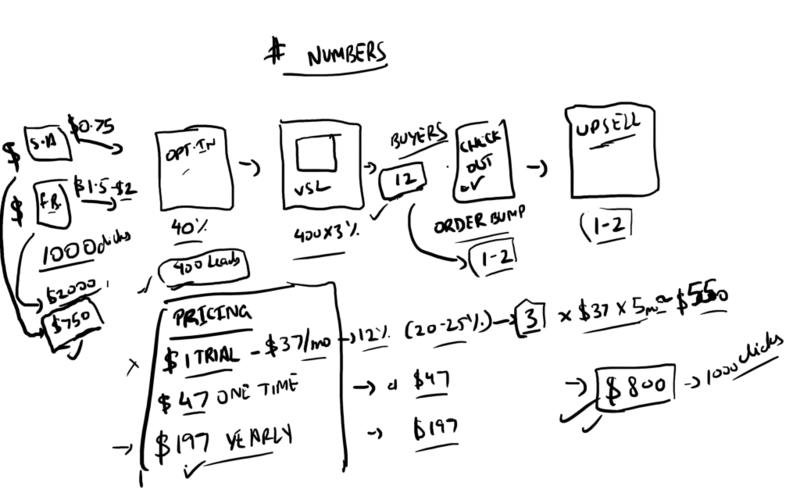 The funnel we’re building will COMBINE list building, recurring revenue, and the potential to recover some cost at the end of cart. We’ll be driving all our traffic to an opt-in page where we get leads. Those who opt-in, will see a training video with a pitch (VSL1) for a $1 trial of our membership site. Then we’ll have the Clickbank checkout page with an ORDER BUMP of a $47 one-time payment. The order bump can be an additional mini-product that helps people get more out of their membership. After checkout, we’ll have an upsell page (VSL2) with a $197 price point – where we’re not actually pitching any new product – but rather SAVING MONEY for them by giving them a 50-60% discount on their annual fees. After they click YES or NO – we take them to the final confirmation/thank you page. For Leads: We’ll be pitching the VSL1 for 3 days, and then we’ll transition to pitch my LiveCoachingCall, and then we move on to promoting Inbox Blueprint. For Customers: We’ll be sending a welcome email, some initiation emails, and some emails that get them engaged with the membership site while motivating them to take action. There are several ASSETS that we’ll be creating in the coming days, including but not limited to ‘Optin Page Creative’, ‘VSL 1 and 2’, FB ad creatives, Autoresponder emails etc. The entire funnel will be built using FunnelForMe <- get this plugin, SERIOUSLY! Pay close attention to this section because this is where you determine how the campaign might look in the future. While all the numbers here are just estimates off of my experience with membership sites – these still give us some initial numbers to benchmark when we start running our ads. Please note that these are not the absolute worst case numbers, but they are also not GOOD numbers. The numbers mentioned below are what you can expect from an average performing funnel. We’ll primarily have two sources of paid traffic. Facebook Ads and Solo Ads. The numbers begin with 1000 clicks. The important thing to remember is that in these types of funnels, FB ads conversion rates will almost always outperform solo ads. Considering a 40% optin rate = 400 leads. We have not included an backend sales in this calculation. We have several potential revenue sources like all the products that we recommend (affiliate revenue) as additional training/tools inside the membership area (the same ones I recommend in my Bizathons) and LiveCoachingCall takers. It is safe to say that we’ll end up doubling the average lead value over the course of a few months. But because of the nature of this operation – it’s difficult to calculate the average retention rate until several months down the line. The reason why the Membership Site business makes sense for ME especially is because I don’t just rely on FB Ads or Solo Ads. I also have my YouTube Channel, my other Email Lists, and a growing following on FlyingStartOnline. So if you’ve decided to launch your own membership site – then spend time building other avenues of traffic sources as well. These are just BLANK lists for now – we’ll be adding autoresponders in a few days. Next, I imported the theme options from this FSO blog over to the DOer WordPress theme – it was all just click-click. Then I designed a quick logo in Photoshop. You can also use a free tool – Canva. I did get stuck when the logo was showing up as a broken image. After updating the theme to the latest version – we were able to resolve that discrepancy. Finally, I created a bunch of blank pages that we’ll be building in the future sessions. All in all – a VERY GOOD session! I’m super excited for tomorrow because we’ll be figuring out hooks and angles for the entire funnel. Thanks for day 2 session. If the funnel you have mapped out here and the mentioned promotional channel, if I want to put some video about the product in YouTube also and put a link of the product and an affiliate marketing link (similar way you are putting under each day’s video on YouTube), will it be a paid advertising or free? Along with a FB promotions and SoloAds, can YouTube also be a promotional channel for the membership site? Oh yes of course. Diversified traffic streams are great. Some free and some paid. In our case, YouTube is a free traffic source. But there’s the “time” component required to shoot videos and build an audience.